Nothing ruins a nice hardscaped scene like pesky weeds, and removing those weeds by hand can be a daunting task. Even worse is doing it in our 100 degree summer days. But what if you prevent the weeds all together? With Gecko Pest Management’s weed control services in Tucson, you can! That’s what TRUE weed control is. Lets talk about the plants first and how they turn from a seed to that offensive eyesore. Seeds remain in the soil waiting for conditions to be right to germinate. Usually in the spring and fall germination occurs, Summer Annuals germinate in the Spring and in the Fall the Winter Annuals germinate. Perennials like grass can germinate year round. However in our arid climate moisture is the key to this process. This would be the monsoon season and sometimes more impressive winter rains. With this moisture the seed germinates and sprouts. Once it has sprouted it will use the sunlight and start the process of photosynthesis. Between our pre-emergent and post-emergent weed control services we can eliminate the weeds at these various stages. As seen in the diagram below. The way we take care of weeds is typically a two part service, Pre-emergent and Post-emergent weed control. The Pre-emergent material is sprayed down on all landscaped areas of the property or any areas on the property in which it has been requested. We do this nearly every six months during the germination seasons of the summer and winter. We mix ONLY the Pre-emergent material in our large tank. This way we are able to spray inside or under existing, desired plants in the yard without damaging or killing them. This weed control method means new weeds wont be able to grow under these plants. Second any existing weeds in the yard are sprayed with a Post-emergent material to kill those undesired plants. This is typically done with a more precise spraying apparatus like a backpack or small handheld sprayer. This helps keep drift or overspray down, minimizing any damaging to nearby desired plants. After a treatment it is not uncommon to find more weeds sprouting up, because of the nature of these seeds they may have already germinated and developed roots, but not yet sprouted above the canopy. As our pre-emergent wasn’t in the soil during the germination there is good chance it could still sprout. During the warranty period, if any weeds do sprout up after the treatment, just and give us a CALL! We will set up an appointment to come out and either treat or remove the weed. As you continue to receive the every six month Pre-emergent weed control services the ocurrance of sprouting weeds diminishes, usually after a year of service, sprouting weeds are almost non-existent. The main difference in our service is that it is a TRUE service in that we do not gamble on the weather or rely on the customer to water this material down. 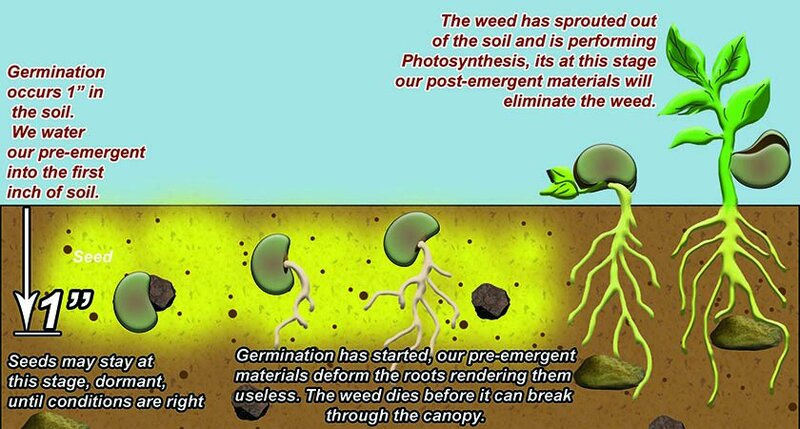 You see, this material must be watered into the soil about 1″ down, as this is where germination occurs. Most companies will have statements on their agreements that if the material is not watered into the soil by rain within several weeks it must be watered in by customer. Sometimes the rain doesn’t come and the homeowner doesn’t get the material watered in as their time is valuable, hence why they called a weed company. Sometimes the customer does get it done, but the results of the treatment are patchy and inconsisitent as the material baked in sun for weeks before it got watered in. So instead of just hoping the treatment gets watered in correctly, we do this process ourselves, this allows more consistent weed removal results with minimal call backs to spot spray sprouted weeds. CALL US TODAY FOR A FREE ESTIMATE TODAY! (520) 579-1701! !